When planning the 8 acres of formal garden at Babylonstoren, we drew upon the expertise of Patrice Taravella of Prieuré Notre-Dame d’Orsan, the gardens in France on which principles our garden is run. Last year in August, our head gardener Liesl Van der Walt went over to work in the French gardens for three weeks (see her blog posts about it here), and this year in March, Giles Guillot, head gardener at Prieuré Notre-Dame d’Orsanso came to work in our garden. He blogged about it in French, and we’re reproducing his experience here for you in English. Liesl, the head gardener at Babylonstoren visited me in the past summer, and it was now my turn to discover her garden and the practicalities of gardening in the extreme south of the African continent. 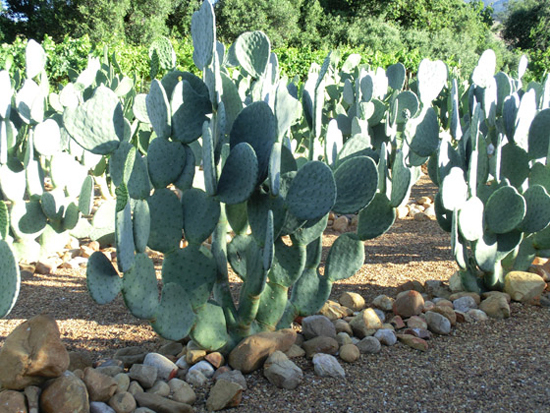 In the direction of Paarl, Stellenbosch, “the valley of the French”, for Babylonstoren, which means “The tower of Babel”. The area is dominated by vineyards and orchards, and Babylonstoren is found in the hollow of a valley, framed by sumptuous huge mountains, such as Simonsberg. This farm, in existence since the 18th century, has numerous farm buildings which are now used as hotel and restaurant complex, and their large garden is now two years old. I was greeted by a festival of citrus trees, fruit trees of all types and in all forms! To be fair, some it was unknown territory for me, such as tomato trees and shrubs of eggs (! ), but I found my bearings with the stone-fruit trees and the fruiting trees. 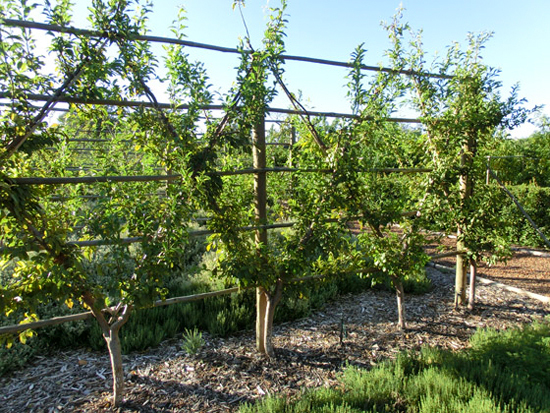 Long rows of simple U-shapes in pears, and vertical and horizontal cords of quince trees that border the potagers (vegetable gardens). The apple trees were also present in horizontal cordons, and free-form was also present. But the most surprising, was the sight of decidious trees which appeared to be in paradise in this region. Palm shapes in oblique one level, three levels, horizontally in four levels – forms rarely seen in most gardens. Other more “free” forms (spindle, table…) are under construction. 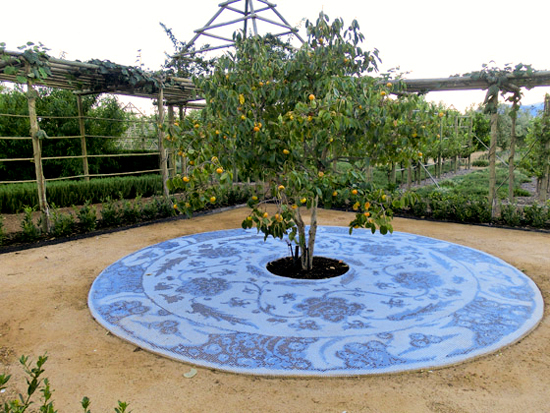 Persimmon tree, with mosaic tiles around its base. 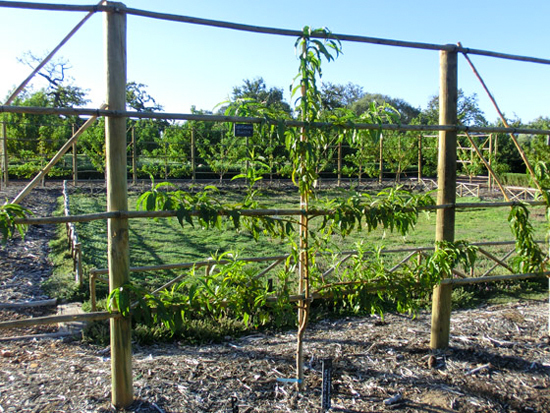 A priori, the principal enemy for these fruit trees is the vigour, and growth is so strong and even “violent”, say the gardeners. So much so that where, in my manual of gardening it says that 4/5 years is necessary for the construction, in one season in this climate the trees can produce the same framework. Many questions, therefore, are raised about how to follow the construction “step by step”, like the protocol implied in the manuals. You can imagine – the discussion was objective and lively! Take the time to slow down the construction of these forms remained a priority, even a tiger may be calmed and tamed! But watch out for the energy and time needed, without any respite. Check in again soon for more impressions and comment on our garden, from Giles Guillot. Love the art work around the Persimmon tree! Have you seen all the Disney World characters in bloom? …talking about Mickey Mouse ears? I will email some pictures we took last week at EPCOT Orlando Florida.